Quick departure from the tidal wave of Imperial Fists of late - I really loved the look of the new assassin models that came out as part of the Assassinorum Execution Force game, and knew when I saw it that I had to have 'em! My FLGS got a copy in for me last night and now that I have it in hand, I have to say that while the minis are gorgeous, the game itself looks like it may be quite a lot of fun as well, which was a pleasant surprise. Took a little time and got the four assassins included in the set built, I am really impressed with the sculpts dynamic poses and level of detail. Definitely looking forward to getting some paint on 'em, just bought the audiobook version of the Horus Heresy novel Nemesis (all about an assassin team sent to kill Horus) so that ought to provide some suitable background listening while I do so! Nice! If it wasn't for the baby currently sleeping on my chest I'd be tearing into my copy right now! Jealous. Mine are still shipping. I am so stoked on this, I'm saving the assassins to build last, not that the other guys need a lot. The detail and the poses are incredible, especially the eversor. 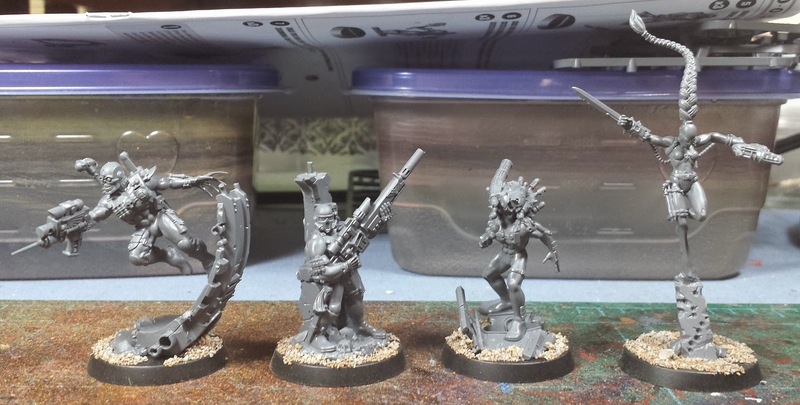 I am sooo looking forward to my copy arriving these assassins look great! @myincubliss: Hah! A good reason! @Zab: Really looking forward to seeing how you paint 'em, man! @Red Scorps: They really are great sculpts!